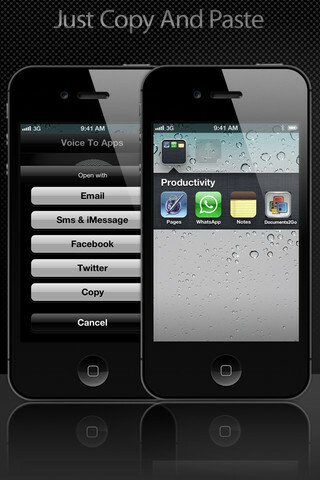 Developer Quote: "With Voice To Apps, just use your voice instead of typing, touch the microphone dictation app, then say what you have to say and the iPhone converts your words into text!" The wonders of Siri never ceases to amaze us. Siri has often been referred to as "man's new, best friend"! That's what voice recognition will do for us! In any event, here's a universal app all iOS users can make good use of and enjoy in both a personal, recreational and professional setting. Voice To Apps - Voice To Messages And Email is a super helpful app allowing you to speak or dictate your thoughts, emails, messages, notes or social networking status which will then be translated to text, and placed in the application you choose. This type of smooth and reliable productivity is the kind of smart feature everyone needs on their iDevice! 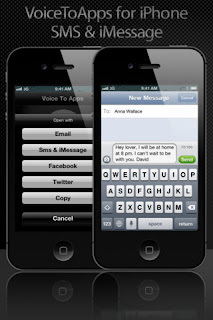 ♦ Send a quick and easy text to family or friends - no hands needed! - Copy text and paste it into notes or a word processing application such as (Documents to Go, Pages, Quickoffice, etc.). - Recognition of 22 supported languages :​ Cantonese Chinese, Danish, Dutch, English GB, English US, French, Italian, Japanese, Korean, Russian - just to name a few! 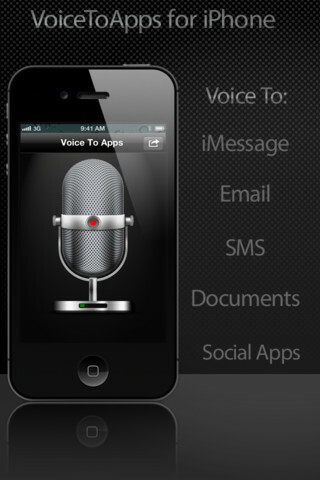 Using Voice To Apps (powered by Nuance) is really a snap. Just open the app, and you will see the sleek, polished microphone waiting for your dictation. If you tap the arrow icon at the top right of the screen, you will see options to: Edit Language, Sign out from Facebook, Sign out from Twitter, Help and About. Language allows you to pick the one you are about to speak. Help gives you the phrases you will need to add a large variety of commands and punctuation to your dictation. For instance, you may speak "New Line", "All Caps On", "Semicolon", "Equal Sign", "Open Quote", etc. Go ahead and tap the microphone and wait till you see the words Connecting, and Start Recording. Begin speaking into the microphone and when finished, tap the mic again. Now touch the arrow icon at the right top of your screen, and you will see option buttons: Email, SMS & iMessage, Facebook, Twitter and Copy. Use any of these buttons to get your message sent where necessary. Each option will open the corresponding application right then and there to save time for you. That's just how quick and easy it is to use Voice To Apps! I found the voice recognition iPhone app to be pretty much on target with what I actually spoke, and enjoyed staying within the app to open the various communication targets. When I think about it, I realize how much simpler life has been since using my new assistant, Voice to Apps, to take note of important thoughts and tasks. COOL CONCLUSION: "Voice To Apps makes it a snap to dictate email, notes, documents and social updates with its easy-to-use, expert voice recognition capabilities!" You have enjoyed an impartial paid post.